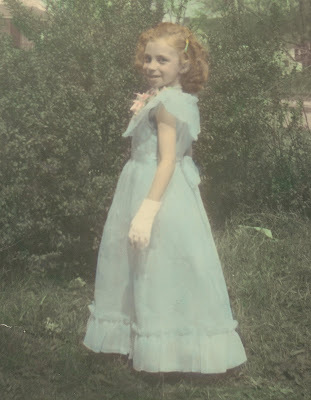 When I was a little girl, I loved to get dressed up in frilly foo foo dresses with lots of lace and ruffles and have my hair all done up with rollers, insisting that my mother not brush through the curls. I wanted the ringlets! I' m not sure if it's specifically just a Southern thing to say (but I'm guessin' so) or not but I can recall being told , "Well, don't you look fancy!" and I always took that as a high compliment. I may be living with a bunch of Y chromosomes but I still love my fancy things on occasion so every Friday I am dedicating my blog to all things FANCY! 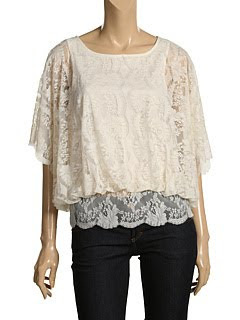 I absolutley love this lace blouse I found on Zappos. It comes in black too but I am crazy about the ivory. I can see this with some nice jeans or capris or even a skirt for church. Also loving those oh so cute, ruffled cardigans that are so popular right now. I found this one at Nordstrom and on sale for $39. Shoes, shoes, wonderful SHOES...Oh, how I love you so! 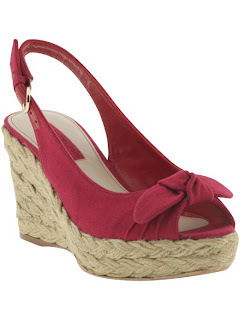 These red, peep toe espadrille wedges on Piperlime are right up my alley. $69 by Bandolino. By the way, Piperlime is an awesome site. If you haven't checked it out, ya need to! http://piperlime.gap.com/? Okay, so I couldn't NOT include a precious little doggie dress since I just recently made the satisfactory discovery that Li'l Bit likes wearing them. I found this on on http://www.doggievogue.com/. Now is this fancy or what? 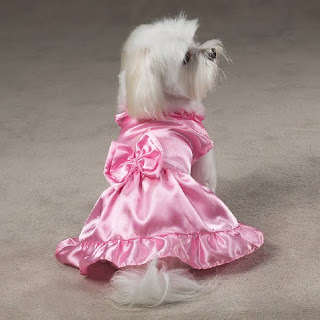 I found this litte number at Macys.. Also comes in yellow, white, brown and turquoise. Ooo La La! 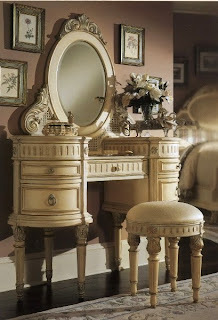 One thing I have always wanted and have yet to have is a girly girl vanity similar to this one. I am hoping to find an antique one after we move into the new house....Step outta my way, Queen Elizabeth! 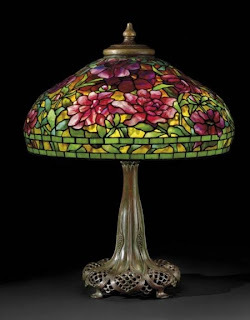 Always been drawn to Tiffany style lamps and this antique one by Tiffany and Co., ca 1910 makes my mouth water....Love the peonies. Sooo beautiful! I really wanted to end with an old photo of my fancy little girl self but was unsuccessful in finding one but while I was looking, I ran across this oh so vintage one of my mom, circa 1940 something, looking super fancy in her Sunday best. I've gotta frame this! What a precious picture. Your mom looks just like she did when she was little. I've never been fancy and still ain't. I've got 6 girls and can't even french braid hair. Thankfully my big girls help with my little ones. Of my 2 biological girls, one is "fancy nancy" and the other won't have anything to do with frills. If you haven't read any "fancy nancy" books you should find one. They are funny little books for fancy girls. You were very fancy and beautiful. I sure was jealous of your frilly dresses. Love this picture of my mom! I have lots of old photos I want to frame. I'm gonna do that when we move. She said she was in a Tom Thumb wedding in Lindale that day. I have seen those "Fancy Nancy" books but of course I did not purchase cause I don't have girls but maybe I'll pick one up for myself one day. lol! Which one of your little ones is the fancy one?